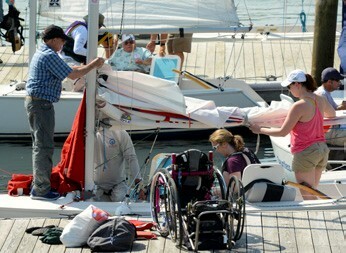 Over the May 29-31 weekend, 17 crews of sailors with disabilities sailed specially adapted Ideal 18s in the seventh annual Robie Pierce One-Design Regatta. Hosted jointly by the American and Larchmont Yacht Clubs, “The Robie” continues to be the only major adaptive regatta on western Long Island Sound. This year, Duane Farrar (Watertown, MA) and Amy Bower (Falmouth, MA), blind sailors sailing with Sol Marini as their sighted guide, bested the fleet with a final total of 18 points after ten races. The trio, striving to compete in the next Blind Sailing World Championship in Chicago, IL, beat out last year’s Robie Pierce winning combination of Mike Hersey (Hyannis, MA) and 2008 Paralympic Gold Medalist Maureen McKinnon (Marblehead, MA) with Hersey’s son Matt reprieving his role as AB (able-body sailor). Rounding out the top three was Craig Wilson (Holden, MA) and Charles McClure (Brookline, MA) sailing with Paula Schaefer and Roger King sharing the AB duties. The Robie Pierce One-Design Regatta was started in 2009 with the objective of expanding the footprint of adaptive sailing in western Long Island Sound. The Robie strives to be as inclusive as possible including sailors with physical disabilities, neuromuscular diseases, visual impairments, and other disabilities. It is also one of the few adaptive events with 17-20 one-design boats starting at the same time. 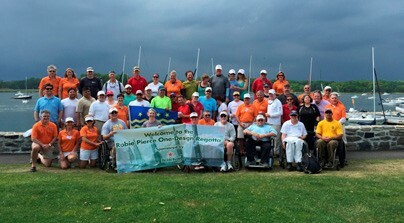 Heineken has been the lead sponsor of The Robie from the beginning, providing generous financial support for adaptive sailing along with Heineken beverages onshore. Dolf van de Brink, Heineken CEO of the Americas, was on the water with his family to cheer on the competitors. For the second year, Burke Rehabilitation and Research, the area’s major rehabilitation hospital, was a sponsor of The Robie. Burke has been a source for new participants, many who serve as crew for experienced disabled skippers. Catherine Evins, a Burke outpatient, sailed with skipper Tracy Schmitt (Toronto, ON), in Cathy’s first time on the water, ever. In the second race they finished second and she was beside herself with joy. After meeting 2012 Paralympic Silver Medalist Jen French (St. Petersburg, FL) and Betsy Alison, U.S. Sailing’s Paralympic Coach, Evans exclaimed, “Today was my day of miracles!” And she wasn’t the only first-time sailor, thanks to Burke. Of the 40 disabled sailors participating, and the numerous accompanying family members and aides, one in five were new to the Robie. The event has established its place as a favorite adaptive sailing regatta—with so many repeat participants—while also attracting new people from the area and across the country and Canada. This year, the crop of first-time Robie sailors included five members of the Warrior Sailing Program, all disabled veterans who are pursuing sailing as a part of their post-service life. This program is underwritten by the Kings Point Foundation and benefits from the leadership of both Jen French and Betsy Alison. These five individuals traveled from five states as far away as Michigan. This year’s Robie was sailed out of American Yacht Club in Rye, NY, with AYC’s Siobhan Reilly as the lead chairperson, with AYC’s Bill Sandberg and Larchmont Yacht Club’s Buttons Padin as Co-Chairs. Together, the three manage all aspects of recruitment, registration, crew composition, race management, and provision of adapted Ideal 18 sailboats to be raced. While Siobhan, Bill and Buttons do much of the work, without the ongoing support of dedicated sponsors The Robie would not be possible. Heineken USA has been the Robie’s lead sponsor since its inception, for the past four years the Keurig Green Mountain community outreach foundation has supported the event. Subaru was also a repeat sponsor as was Burke, Magnum Bars, Gill North America, and the Sailing Foundation of New York. After receiving the perpetual trophy presented by AYC Commodore Peter Duncan, top skipper Farrar commented that his “regatta haircut had done the trick.” As a blind sailor, Farrar looks aft when sailing downwind and keeps his hair short to “sense the wind” as he steers. Apparently he was right. The 2016 Robie Pierce One-Design Regatta will be held at Larchmont Yacht Club from Friday, June 3 to Sunday, June 5, with the Robie Pierce Women’s Invitational returning on Thursday, June 2. Visit www.robiepierceonedesignregatta.com to learn more.